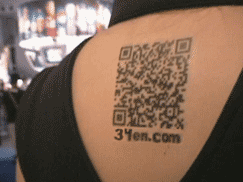 And the winner of the most useless tattoo ever award goes to: (drum roll, please)…the QR Code!! Yes, for only a small handful of cash and a hour or so of your time, you too can have a QR (Quick Response) code permanently tattooed on to you! The advantage? Well, once tattooed with a QR code, you can access things like social networking sites via your flesh! Sound stupid and utterly useless? That’s because it is!! Well, count me in as someone who isn’t happy to see them inked on to skin. I know this will paint me as some sort of tattoo Nazi in the eyes of the truly open-minded tattoo fanatic, but hey, you’ve got to draw the line somewhere and this is a tattoo that just doesn’t need to exist. If someone were to come up to me and tell me their in depth and touching story of why exactly it is that they got their QR tattoo, then perhaps my mind could be changed. But for the most part, it’s just a stupid idea and a stupid, careless tattoo.